The Battle of Kursk took place in July and August 1943. At this point, Germanyy and the USSR had been at war for more than two years. The Germans had failed to defeat Russia in their initial 1941 invasion, Operation Barbarossa, and their 1942 offensive in the Southern part of the front had ultimately led to a disaster at Stalingrad (Volgograd). The Germans strategy for 1943 in the East was intended to be primarily defensive: they would inflict heavy losses on the Soviets used a combination of prepared defensive lines and limited offensives. As part of this strategy, the Germans intended to launch a limited attack on a Russian salient around the city of Kursk - Operation Citadel (German: Unternehmen Zitadelle). However, over time the size and scale of this operation continued to grow in size as the Germans added more and more units to the plan. From spies and other intelligence sources, the Soviet High Command (Stavka) was well aware of the Germans intention to act in this sector, and prepared a deep network of fortifications so as to repulse the German attack. When the Germans did attack, they were unable to penetrate more than a few miles into the Soviet lines, and only then with extremely heavy losses. They broke off the attack after a few days as a result. After the German attack, the Germans then launched a major counteroffensive, driving the weakened Germans back across many sectors of the front. The Battle of Kursk was the largest tank battle in history. Operation Citadel was the last major German offensive on the Eastern Front. 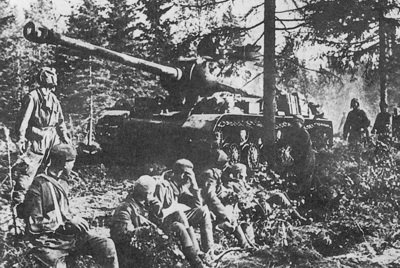 It was also the first time that a German Summer offensive had been defeated by the Soviets. After the Battle of Kursk, the Soviets never again lost the initiative to the Germans.